Meniscal problems are some of the commonest knee problems requiring surgery. The most common meniscal problem is a tear. In young patients tears are normally the result of a sporting or other significant injury. As we grow older then the meniscii degenerate, becoming weaker and more fragile and they can tear with more minor injuries or even spontaneously during the course of day to day activities. Mensical tears cause a number of symptoms commonly cause pain and the larger and more mobile the torn piece of cartilage is the worse the pain. Pain is usually localised to the side the cartilage tear is on. They also commonly cause clicking and catching sensations and can cause the knee to lock. Locking is when the cartilage jams in front of the knee and prevent straightening of the knee. They are often associate with swelling of the knee. These symptoms are often very well localised and the patient may be able to put his finger on one a tender area at the site of the cartilage tear. Sometimes cartilage tears are associated with other injuries such as ligament ruptures. Therefore, in a middle aged or elderly patient a cartilage tear may occur with a relatively minor injury such as rising from a chair, or a minor twisting episode. Indeed sometimes it is difficult for the patient to recall the exact moment at which the cartilage tear occurred, but recent vigorous or unusual activity may be relevant e.g. heavy lifting, walking over uneven ground. The diagnosis if often clear from the history of a twisting injury and pain overlying the torn cartilage. The pain is normally worse with twisting or turning and is often associated with intermittent locking or catching and swelling. If there is any doubt then an MRI scan can be very useful to accurately determine if a meniscal cartilage is torn. Unfortunately most cartilage tears do not heal and as we get older the chances of healing reduce as the reason the cartilage tore on the first place was due to degenerative changes within the it. A cartilage that is torn acutely and is locked out of place, as in the image above, can be very painful and prevent the knee from fully extending. In this case arthroscopic surgery should be performed as soon as possible in order to remove or repair the torn meniscus and allow the knee to fully straighten. 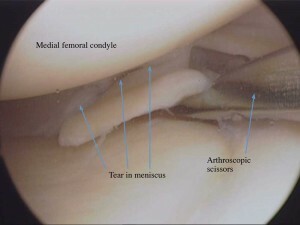 If the cartilage is torn but not stuck out of place it is likely to cause persistent symptoms of pain – particularly on twisting, intermittent locking and catching sensations and swelling persist then arthroscopic surgery to remove the torn portion of the meniscal cartilage can be performed. This greatly improves or resolved the symptoms in the majority of patients. 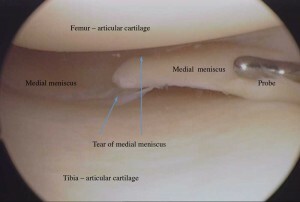 Cartilage tears in young patients can have the potential to heal if repaired and this can then help preserve the load distributing function of the meniscus. However, meniscal cartilage tear often occurs as part and parcel of a degenerative ‘wear and tear’ process and these tears won’t heal even if repaired. Unfortunately most meniscal cartilage tears will not heal even if they can be repaired and if symptoms persist then arthroscopy to remove the torn portion is required to relieve symptoms. 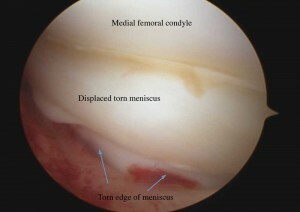 When a meniscus is torn the load sharing function of the torn meniscus is lost. This leads to increased contact pressures between the femoral and tibial articular surfaces and this in turn accelerates the wear and tear of the articulating surfaces that eventually leads to wear and tear (osteoarthritis). Surgery is to relieve symptoms and does not accelerate or prevent the development of any arthritic changes as the torn part of the meniscus is not providing any useful function and if anything the torn meniscal fragment might cause further damage to the articular (joint surface) cartilage. articular cartilage may be damaged after a jarring or twisting injury of the knee. It may also occur in conjunction with meniscus and ligament injury. The result can be a loose fragment of articular cartilage which leaves an exposed area of bone in the knee (a crater in the otherwise smooth joint surface). Alternatively the damage may be a breaking up or splitting, but not complete loss of, the articular cartilage. In younger patients, this will usually result from a clear injury when there is a shearing or impaction force between the two surfaces. As we get older the articular cartilage becomes more degenerate and fragile, so injuries occur more easily (similarly for tears of the meniscus cartilage). In these cases there seems to be an overlap with the early beginnings of osteoarthritis. Joint surface injury can be a potentially troublesome condition, particularly in young adults, because it may give rise to long term problems. It has been known for many years that articular cartilage does not heal well. If the meniscus is also torn, the prognosis is worse. It can be difficult to treat, and can increase the risk of developing significant osteoarthritis. The symptoms of chondral injury are pain, clicking, catching and swelling. Sometimes locking may occur. The pain may be well localized to the area of damage. Occasionally, it is difficult to say exactly where the pain is arising from, and the knee feels generally uncomfortable. The diagnosis of a chondral injury in the knee joint can be made on the story of an injury along with examination of the knee which may reveal nothing more than discomfort and swelling. A bigger injury, when a piece of cartilage and bone has come off, is called an osteochondral fracture, and will present with more severe pain and swelling due to bleeding into the knee. An example of this might be when a patella dislocation occurs. X-rays are useful if there is a small fragment of bone as well as a fragment of articular cartilage (i.e. osteochondral damage). If not, the x-rays will probably be normal. An MRI scan will show up most chondral injuries, but can miss smaller ones. If there is a suspicion of such an injury but x-rays and MRI scan are negative, arthroscopic surgery may be required both for diagnosis and treatment.